Ozil and Cazorla: How Do Arsenal Get the Best Out of Both of Them? Editor’s Note: Moving on from the transfer window, loyal supporter and always upbeat Proud Gooner returns the focus to OUR players, posing a question about two of them which many have pondered. Enjoy. Whilst watching from the stands a few times in Mesut Ozil’s first season, there seemed to always be a few fans chatting away about him and Santi Cazorla. Some even went as far as saying we should only play one or the other. Both are creative players who like the same position; both like to take fee kicks and corners. Also, I don’t think it’s a coincidence that since Ozil arrived Santi Cazorla has scored a lot fewer goals. Am I wrong? Do you fine knowledgeable Gooners see it differently or has it been sorted by time? One more thing the two players have in common is that both can play left wing. But Alexis has solved that one. Or has he furthered the problem? Who knows? This is why I would like to get a few views on this one. So, how can we get the best from both of them? Should we play just one or the other? What is the best position for both men? Which position can they take and make their own? Put it this way: Ozil has played right wing, left wing and in the hole (as a #10). Cazorla has played in the hole, on the left wing and now as the front partner of a pair of defensive midfielders. Cazorla is now 30, still at his peak, in my opinion, and still able to wriggle and turn and run away from the best of them, as can Ozil. Do you have a preferred player and why? The main question is, of course, as the title says: how do we get the best out of the two of them if both are on the pitch? Or, is it best to play just one of the two of them–at least some of the time? 40 Responses to Ozil and Cazorla: How Do Arsenal Get the Best Out of Both of Them? It looks great , nice pictures you selected. Il be very interested to hear your view on this topic. On what i believe are 2 of the very finest world class midfielders in the business . If Alexis is rested or subbed that would work very well. When Santi was played on the left he scored a lot of goals. I think he does well as the second DM, but is it a talent a bit wasted, the way his goals have dried up suggests so. Cazorla defo scors more goals then Ozil at the moment. Many different possibilities . I would really like to see our players get a position and make it there own week in week out. I am not saying the above is my out and out prefer , just another option which says pace to me. You are spot on that both played in similar roles and were running into each other’s feet when they were first played together. Now that we have Santi play behind Ozil it all makes much more sense. We need two creative midfielder who can find gaps to avoid opponents man-marking our creative force out of the game. Santi can come from deeper with a great overview of what is in front of him and Ozil can do all his magic in most claustrophobic of spaces. On top of that Ozil is mobility personified and often moves to the left wing because there is space.. and space means time and options and that is something Mesut likes a lot. By doing so he leaves space for Santi to move towards the D and this is working better and better the longer they play together. Together they offer a lot of magic on the pitch and without them we would be a totally different side right now (especially with Jack out injured who can play in both positions). 17HT, great pictures buddy. Really good depictions of how much they seemingly value each other! Rosicky and Le Coq as the holding DM’s when Rosicky returns. I love seeing our Tommy slide tackling. Good writeup. Yes, Santi had scored fewer goals as before Ozil, he plays in the hole just behind the striker. But before him, our captain played AM and his goals declined tremendously after Santi came in and he was moved back. For me, Santi is a better playmaker from the deep. His defensive skills and turnovers are far better than Ozil, who looks better in attacking positions in the central area last season. Also, i believe that our issue is not about the players and their positions. How can the lads go from hero to zero in a matter of a week? It is a matter of mentality like i had always mentioned. We have to be confident, not overconfident about our squad and we will score. I love your reading of the game Total Arsenal. I too think it has settled down nicely at the back end of last season, they started playing together well. Cazorla took his new role with grace, that perhaps Wenger even saw fit to have paced his the armband this season, much like Arteta. I do think we miss out on a bit from Cazorla there though, the goals highlight this. I think it’s still slightly a work in progress. Me and you are on the same page. regarding Arteta. I believe these 2 are the keys that can unlock the door. If they really put there minds to it, work hard together, we could start to see some of the best football seen yet. Have a good weekend skipper, see you later. It is no secret that Cazzor has moved back into a more central midfield role to be Le Coq’s DM partner, and that has by its very nature removed him from the immediate scene of the accident goal area, so his chances or opportunities to score have been restricted. It is purely fortuitous that Santi’s move to this deeper midfield role, perhaps prompted by the arrival of Mesut, has made many fans add up 2 + 2 = 5 when it comes to a decline in his goals scored. So, in answer to your question, Oh Proud One, Santi’s reduction in goals scored was not directly linked to Mesut, other than there might not have been room for both of them in the same team, had we not had injuries in central midfield at the time [and still do to a certain extent]. I like your opinon on it and like that you mentioned Flemini and Arteta. Who perhaps could be a better option solely as a DM. ? Are you happy for Cazorla to stay there for the forseeable ? Or would you like to free him up back into his more natural position (s)? It just imo he is one of the finest in the EPL if not the world, he is so skillful , 2 footed a real little magician who’s goals we could do with? As you and TA rightly say though having Santi silky skills to wriggle away from player once they have been tackled , then find a pass to Mesut is really good. But if you were a manager of pure tactician there would be times when you would just select 1. Though last season we did see him change his aproch a bit. Most teams are to strong now in the EPL to go all out on. So from stand point Santi as a DM works very well. You are right. 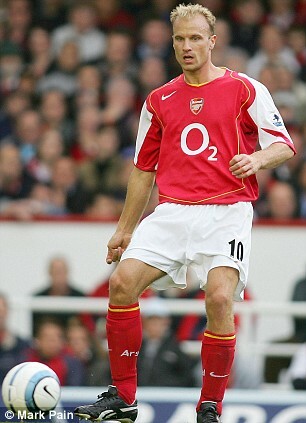 Santi is a little genius and has the most exquisite skills, so he is a little wasted further back than he used to be. I would be more than happy to see him further forward, but AW does have a problem fitting a quart into a pint pot. Rotation is all well and good in theory, or where there have been a lot of intensive games, but in reality a settled stable side is often the best one to achieve trophy success. I put the last two names in the list, because if we play 1 upfront, (say) Giro, and Le Coq at DM then if we play 4 : 4 : 1 : 1 there are potentially 10 players to fill 4 positions. We do have so many options. I wonder if that 1 could work, with both Cazorla and Ozil on the left. Alexis hunting down all there players working hard and ready to attack also. We know Alexis is a great defender to. It is a good problem to have, but must give him a bit of a headache. Also i really like the OX. Your other point is the 1 i would love Wenger to solve . Put them in a position and let them make it there’s. I am not against Ozil playing wide at the moment though i was in the past a little. I would surely better if the player’s all became masters of a position for all season long. The more i think about as you said Santi is wasted as a DM, Though i give him full respect for taking it on with pride. We don’t want him to lose his attacking instinct . Do we? Hey PG, Nice one…Ozil and Santi–and the problem of them playing together–is just about the least of my worries as an Arsenal supporter. Santi is perfect as a deeper lying mid with the skill to get free for that massive range of passes–with either foot. Yes, he’s not a defender but he’s just fine at organizing the pitch and playing us forward. Perhaps it puts us under a bit more pressure to win the possession stat, but that’s the sort of football I’m happy to watch. Ozil, IMO, is just about the best I’ve seen in terms of running to use and maintain spacing. On top of that he’s got a fine eye for a pass and the ability to execute what he sees–at least with his left foot. He’s very perfectionistic, which makes Santi’s easier mood a great foil for him. In truth, I think both should play together whenever possible and the bigger onus is on others, notably Alexis and Ramsey (and whoever plays up front) to work with them, keep moving and maintain that spacing we need to put defenses under pressure. Occasionally we can use one or both of them to create overloads (play quick triangles) and break forward, but that will usually be with Coquelin or one of the FBs. The bigger bonus is when they find the longer outlet pass (Santi, usually) or the killer throughball (Ozil). We need the rest, however, being OK letting them stay at the hub of the action and actively moving into space, often away from the ball (out towards the touchlines), following Ozil’s example. (If others insist on coming central to try and always get on the ball, Ozil can become a peripheral character.) With these two we have the ability to mover the ball forward (and change sides of the pitch) just about as quickly as any team in football. Whether or not we use this great advantage, however, I think, is heavily dependent on others filling those spaces (making themselves into targets) with intelligence. You’re right that we need a few more goals from these guys–if for nothing else than to keep defenders honest (i.e., worried) as to give them just that bit more space to take an extra glance before finding a target with a pass. That’s good to hear you say, they did seem to find that balance the second half of the season. Santi has performed brilliantly in that position. So maybe you are right that is the way it will stay from now on. Cazorla is more up for the fight, has a lot more goals in him, i think Ozil will start to increase his goals a lot soon, let’s hope so , if not i still have a nagging doubt . I mean Ramsey is a starter nearly every game. Could he not take that position.? The Ox has a shout . That the problem has been solved our results proved that in we won more points then any other in the 2nd half of the season. Maybe we should just leave it like that. Ok so where are you playing Ozil #10 all season long? Nice points, 17, and I love your point about the sort of football you like to see — me too. Now that is why I also will always support the vision of Arsene. Nice post PG – You could have a full time job through this interlull, creating a series out the best combinations here and there? Mind, you have a similar thought to me on the CB pairing for the next game, so that is no longer this simplest job. To this post. I agree with what TA said, and what RA added. That is, the move to put Santi deep was fortunate, but Santi made it work for him. The real key is you do not often see them working the same space at the same time. They each move to where the other is not. As for Santi scoring less? Well apart from his shots have not been good enough, the crowded central area does not play to his strengths either. If we score on counter-attacks, then not only is Santi coming from deeper, but he is not as quick as the others. So I think it is a combination of that, and the lack of goals may leave him a tad less confident? However, it really depends on who else is on the teams if he plays, sorry, make that ‘starts’ on the left, because like so many, he wants to come inside. I think it gives him a better picture as to where every one is. Probably why he has been so effective in the deeper role, the whole game is in front of him, not just a sideways view? That is where I would keep him. I must say i like Kosielny and Gabbi. That Micheal Cox piece is very good and perfect for this topic just put out earlier, plus it gives Wenger reasons for Santi playing there. But also says he could play more advanced again if other players play that position. That Santi piece by Mr Cox kind of wrapped up Cazorla’s position. 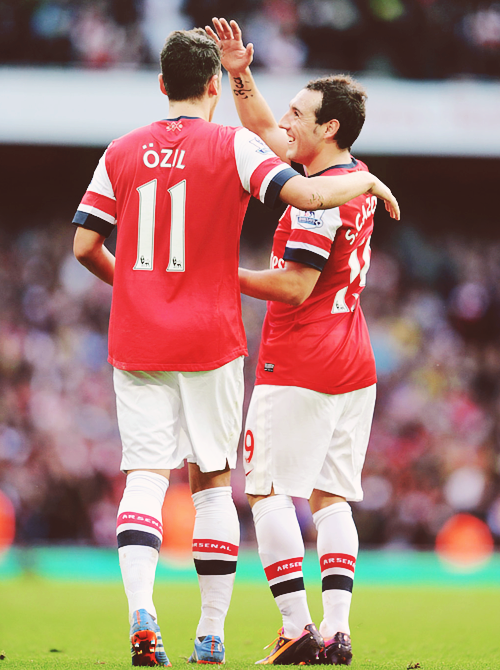 Ozil and Cazorla i just want to build up a strong partnership no matter what position they play in. They could both get a start in any club in Europe, together they could both kick on and create the style and tempo of the new total football at the club if they want to. With the likes of Walcott, Alexis and Giroud.to feed we really should have a very exciting brand of football, we already have but they can raise the bar. In Arsene we trust! Or this PG does. Why cant couqelin sit deep and both play in front of him? Ramsey has offered little so far this season and we are leaving the OX on the bench to accommodate Izil. OX and Alexis wide gives us more pace and power and create far more chances for the striker. Its a no brainer! One final thought on this pairing. You mention building ‘a strong partnership’ between the two. I think AW may persist with Ramsey out wide to develop one there? From my point of view, I think that is a mistake. The playing success achieved by Santi and Mesut is not only because they form a symbiotic relationship by helping each other perform a similar role, ie being ‘creative’, but also from playing a position which they can produce their best. This is not the same with Ramsey out wide. Strangely enough, I put Ramsey playing central, and deep, as being the other midfielder that compliments Ozil’s role really well. Again, for the simplest of reasons, because he runs in to spaces. So not only does he provide Ozil with a target for his pass, the two should not collide in the middle, with both vying for the same space. Like you PG, with the thought of 3 CB’s to gain an extra attacker/midfielder, I have had thoughts on a similar line: Try this 4-4-1-1 idea. The non bracketed player = nominal starting point. Brackets show the possible lateral positions. Strengths: Attacking player near Giroud; Ramsey can make his runs to the spaces. Bells overlapping, providing width. Nacho could do similar with Bells staying back a little more. Weaknesses: Only two goal scorers, both fairly central. Massive hole behind Bellerin. I never said it would be perfect? Cazorla in the number 10 and Ozil on the right flank. I think Cazorla is a more direct playmaker with a better eye for through balls in congested areas than Ozil who appears more effective at playing the last pass when Arsenal are counter attacking and linking with an attacking full back (i.e. Bellerin). That set up would also allow Cazorla to drop deeper centrally alongside Ramsey and Coquelin when Arsenal are defending, vacating the central attacking midfield space which Ozil could subsequently drift into from the right when Arsenal counter attack to feed two of Giroud, Alexis, Ox and Walcott, stationed on the left flank and in the centre forward position (e.g. think Ramsey’s assist to Alexis in the Liverpool match last season or Ozil’s assist to Giroud in the match versus Aston Villa). Should we play just one or the other? I think Arsenal’s best team features both Ozil and Cazorla. What is the best position for both men? Cazorla in the number 10 and Ozil on the right flank. Which position can they take and make their own? I think Cazorla in the number 10 and Ozil on the right flank would be first choice in those positions. and I think Rosicky and Wilshere would prove effective back ups. Both players have their strengths and weaknesses. For me though I think Cazorla is probably the more complete player than Ozil (accounting for both attacking and defensive qualities. That said I think Arsenal’s best team features both Ozil and Cazorla. Some great comments thanks BK’ers. I agree that we could be filling the wings with better options, the 2 you choose would work a treat. The Ox is very much ready now, he did well v Newcastle, so perhaps Wenger is going to run with your idea. I am not against Ozil on the wing these days, in fact it could be his best position, due to his not so good defence skills. Out there he can beat his man, find his eye of a tiger pass, job done. It also frees up the middle. I did say i would like to see players make 1 position there own, but on reflection perhaps its better not 2 in regards to these 2? Plus it does make us less predictable.? Gerry, thank you il check out your link after replies. I like the way you have put the space topic in there because that is wht we have stuggled to find so far this season, so is very important. I agree it is still a work in progress, it is quite annoying that the international break has come so we could not work on a few of these things. All i hpe for is they all come back fit. As you also said Jack will be fit again after the break. Wenger will want to get him some game time for sure, so he will have to be fitted in. I remember an interview with Jack where he named some Midfielders that he lookied up to and would like to add parts of there game to his. 1 was Pirlo where Jack said he would like to become better defensively so he has sitting a bit deeper in mind and spreying the ball about, like a quarter back.Lucky his new injury was just a fractured bone so no compllications in fact this rest up could work out very well for him, he should be truely well rested and healed. It could be a blessing in disquise. Cheers PG and well done for getting back to everybody – you are a gent! I must say i agree with you so far Cazorla has been a better performer then Ozil his stat’s back us up. His commitment is there to see, plus he goals. But like i think both should start nearly every game, i do think we can get more out the 2. They have sorted vout the corners, free kick. There are working a lot better together, but i hope for great things. Your Welcome TA glad to be able to do my bit. Thanks and top man you are to Skipper. That was a good read on OZIL in that link thank you.